Noodle brushes can be bent by hand into any shape you need, over and over again. They come in 17" and 27" lenghts. 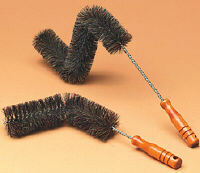 Both lenghts have 2 1/2" tough fiber bristles, excellent for cleaning smoke chambers, heat tubes, and pellet stove heat exchangers.